Discussion in 'TV Central' started by ClassyCo, Jun 30, 2018. I didn't know where to put this thread. Initially, I thought of putting in the Cult TV section, but after remembering that many classic television series have been discussed here, I decided to drop this little thread right here in TV Central. The Twilight Zone was an American anthology series that aired on CBS for five seasons (1959─64), totaling 156 episodes. It was created by Rod Serling, who served as both the series' executive producer and head writer. Each episode profiles a fictional stand-alone story in which characters dealing with unusual circumstances, all happening while they're in the Twilight Zone. The show was predominantly science-fiction, but also featured stories dealing with paranormal, futuristic, and Kafkaesque events that lean towards fantasy, horror, and the supernatural. While not a major ratings winner, it racked in the critical accolades. Many of its episodes are considered some of TV's finest, and have been listed on lists as such. The Twilight Zone itself was ranked as the third best-written television show by the Writers Guild of America in 2013, and TV Guide has listed it as the fifth greatest series of all time. If I'm recalling correctly, I got into The Twilight Zone several years back when I caught some episodes during its annual marathon on the Fourth of July. I recorded some episodes on the DVR, bought some of the "best of" DVD sets, and now regularly watch it on Netflix. What's some of your favorite episodes? The first episode of The Twilight Zone I clearly remember watching was season one's "The Hitch-Hiker". I believe I first caught this episode during Syfy's annual Fourth of July marathon of the show. Her name is Nan Adams. She's twenty-seven years old. Her occupation: buyer at a New York department store. At present on vacation, driving cross-country to Los Angeles, California from Manhattan. This is a definitive episode of The Twilight Zone, an opinion many modern-day critics would certainly agree with. Nan travels her way to Los Angeles, and is followed by a mysterious hitch-hiker. Without any known form of transportation, this hitch-hiker still manages to be following the young lady closely, which naturally frightens her. I won't spoil the ending for those that haven't seen it, but Nan's trip was certainly interrupted by a detour through the Twilight Zone. The aptly named series (curiously enough, JFK liked the word "twilight") ran during the period we came our closest to planetary obliteration, and we knew it. And that awareness created a ghostly vibe in many movies and TV shows that is effectively described as sacredly pre-apocalyptic, making it a perfect era to shoot horror movies and do "spooky." All you had to do was turn a camera on, such that even Opie losing his baseball in the haunted murder mansion on the edge of Mayberry is ridiculously ground zero creepy despite being absurdly comedic. It's just the sense that the veil between this world and the next was somehow thinner at the time. And it absolutely stuck to celluloid. No wonder moviedom's most famous murder (the shower scene in PSYCHO) happened then, as well as the most eerily machiavellian, high-level political murder in memory. THE TWILIGHT ZONE was perhaps the series most emblematic of all that, though many other of the period had similar elements reflecting this early-'60s zeitgeist. And this seemed to involve a profoundly forlorn, utterly simple, child's eye view, undiluted in its sadness and its bottomless mystery... It almost feels like the center of time, and may well have been. 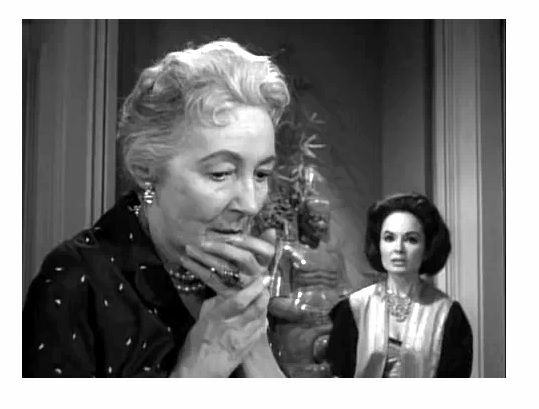 No, TZ wasn't a huge ratings getter, as most anthology series never are because they don't have the luxury of the same cast every week, which keeps viewer loyalty -- at least in prime time -- below a certain level. But TZ was the kind of series everyone seemed to be aware of at the time, even if they didn't watch every week. But no genre like sci-fi has more faithful fans long term, and TZ did the genre about as well as any show ever has, its episodes and concepts copied ad nauseum for decades. I wished they'd never gone to a full hour for season four, as those episodes felt padded and soapy, and I'm glad they returned to 30 minutes for its fifth and final season. I would have liked just one more year, but nothing beyond that. Had TZ kept running and gone to color (as all shows had to by 1966) it would have morphed into NIGHT GALLERY. Now that you have addressed it, several shows from that era often incorporate a creepy atmosphere from time-to-time. I have yet to see any of the Season 4 hour episodes, but I've heard that they weren't too popular with fans, which resulted in its going back to half-hour for its last season. Netflix only has the half-hour episodes. But it's the haunted purity of it which makes that era distinctive. Being a fan of classic films and film stars, I naturally have a fondness for any film or TV episode dealing with the make believe of Hollywood's glossiness. In its final season, Twilight Zone (now sans The) airs an episode called "Queen of the Nile" starring a beautiful Ann Blyth. The story concerns film actress Pamela Morris, and the mystery surrounding her ability to stay seemingly forever young. A young columnist, Jordan Herrick, is hired to find out her secret to staying young, but as we learn in the opening narration, he doesn't know that he's about to look into the face of the Twilight Zone. His visit with Miss Morris starts smoothly. She's friendly, and he is introduced to the woman she refers to as her mother. Near the end of their dinner date that same day, Pamela places a scarab beetle on Jordon, which consumes his life, after-which Pamela places it on her chest and inherits the life he lost. I love this episode. I watch it often. Me, too, actually -- that's a good one. Some fans complain that it's too flat-lighted and lacking atmosphere, and photographically I supposed that's true. But it totally works anyway... And who doesn't love Celia Lovsky's frustrated "mother" performance? She always reminds me of Jock Ewing's second first wife (Susan French).